Domesticated hamsters can be so affected by very cold temperatures that they fall into hibernation. During hibernation they experience a dormant state in which their normal bodily functions are suppressed. 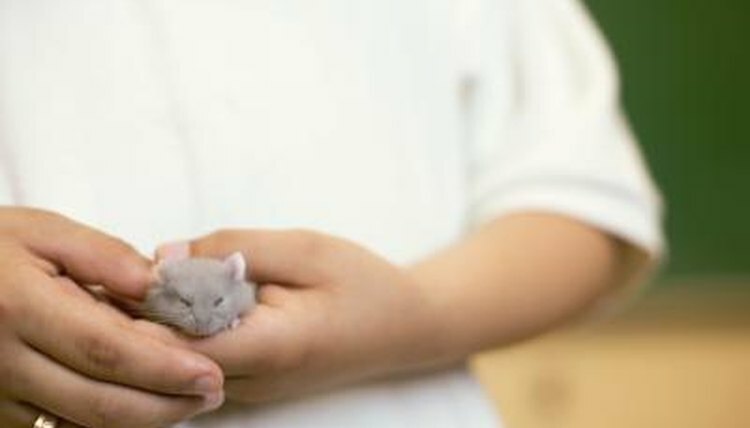 To determine if your hamster is hibernating you will need to observe his breathing, body temperature, responsiveness and overall appearance. A hibernating hamster will exhibit a marked decrease in all of his vital signs and it will appear at quick glance as if he has died. His breathing will be almost imperceptible. Upon closer examination you will be able to see evidence of very slow breathing in a hibernating hamster and even minor twitching of his whiskers, which is a sure sign that he is still alive. A hibernating hamster's body temperature will plunge along with his heartbeat and breathing rate as he enters into and maintains his deep sleep. He will feel very cold to the touch. Areas of his body that have less fur, including the ears, paws and nose, will feel particularly frigid as his body prepares itself to conserve energy throughout the cold, winter months. One of the main ways to distinguish between a hamster that is hibernating and one that has died is to pick him up and observe his limbs. During hibernation your hamster's body will appear lifeless, remaining completely limp even as you manipulate him. Conversely, his body would be completely stiff, particularly his limbs, if he had died and rigor mortis had set in. Right before a hamster prepares to go into hibernation he will consume a larger quantity of food than he normally does so that his body can survive on the excess fat after he falls into his deep slumber. Your pocket pet can fall into hibernation within hours, so delving into a deep sleep after a big meal can signal the start of the cycle. Hammy's World : Do Hamsters Hibernate?